Another day, another Apple rumour – but this one comes with a fully mocked up concept that looks like something straight out of minority report. German designer Eric Huismann has created a beautiful mockup of what he thinks the iPhone 6 could look like. The iPhone 6 device is 17% thinner than the current iPhone 5, includes a 10 Megapixel camera complete with 1080p video recording, and an upgraded A7 Processor. The iPhone 6 display remains at the 4 inches the current iPhone 5 measures in at, which seems to be somewhat of a sweetspot for many. However, this iPhone 6 concept has something the others don’t – a transparent display. It’s not the first time we’ve heard about the prospect of a transparent display, with some thinking this would be Apple’s next step, while others claim it will never happen – but on this occasion, it does make this iPhone 6 concept look very cool indeed. A transparent display not only looks good but would take augmented reality to a next level, being able to physically see the aspects in front of you with software overlays on top. What is interesting is that the top and bottom areas of the device remain opaque and presumably is where the internal components will sit, including that brand new A7 processor, together with the 10MP Camera. Somewhere in with all lot is the battery, unless of course the battery is transparent too, and I have to say that is my gripe with this iPhone 6 concept; whilst it looks fantastic and a transparent display would be great, it just doesn’t work. There is simply not enough room to fit all the internal components of the device into the top and bottom opaque panels, at least not a decent enough battery to last more than an hour. Nevertheless, it is a great iPhone 6 concept, albeit unrealistic. 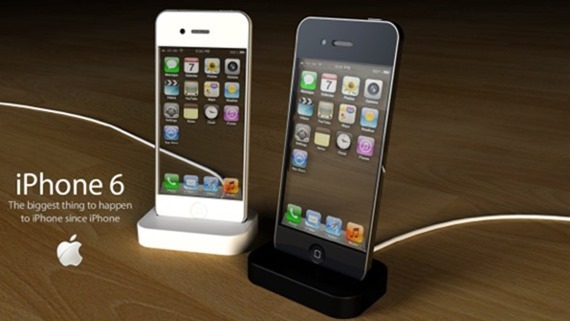 Let us know what you think of the iPhone 6 concept in the comments section below.